Nebraska Crop Circle: 'Sign' of the Times? Farmer Russell Anderson didn't know what to think of the mysterious pattern in his cornfield when he saw it Monday morning. It wasn't there Saturday when he last drove by to check on his crop north of Lincoln. "Maybe something like a twister set down on it," was Anderson's first thought as he looked at it from a dirt road. "I've seen tornadoes and twisters. They do damage to quite a bit of ground." What he saw looked liked a big depression with a corridor leading to a smaller one. 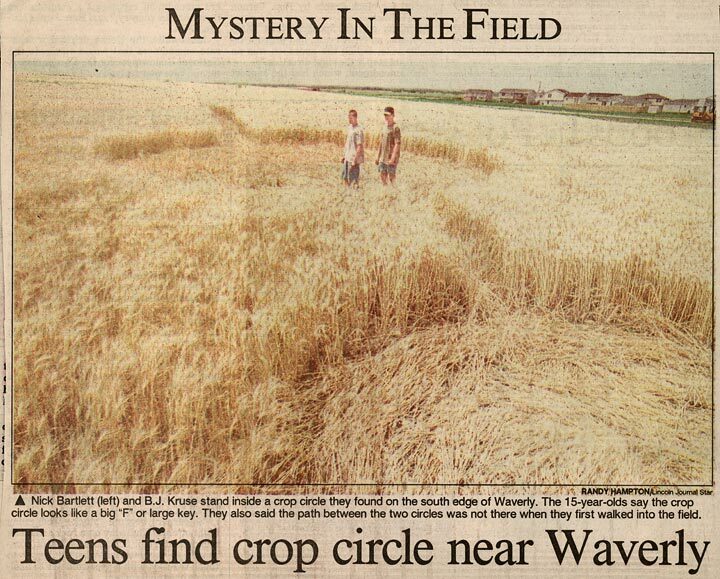 Anderson believed he had stumbled onto a crop circle -- similar to the ones in the summer hit movie "Signs" starring Mel Gibson. After all, there were no tracks leading to the pattern and the corn stalks were laying flat on the ground in a counter-clockwise direction as if someone had mowed them down. But upon further investigation and talking to a Lancaster County sheriff's deputy, Anderson realized that the pattern in his 45-acre field was made by humans and not aliens from another world. "I don't believe in aliens and all that stuff anyway," said Anderson, a 44-year-old farmer who goes to church regularly. The big and little depressions turned out to be a large circle about 50 feet wide with a wide cross on the lower end. Deputy Jerry Witte, who went out to the field around noon on Monday, said it was obviously man-made because the large circle was perfectly round. "It looks pretty good. All the corn is laying in one direction," he said. "After the little trail, the corn is in different directions. It looks like they stopped and started something else and didn't finish it." Normally, the person who made the pattern could be charged with criminal mischief, Witte said. But whoever did this was lucky because Anderson didn't suffer a loss. He had already declared his dryland corn in that field a loss because of the drought and grasshoppers. "It's kind of one of them weird deals," Witte said. Anderson said he is perturbed that someone trespassed on his ground. However, he isn't too angry. As far as sightseers, Anderson just wants people to stay on the road and not go into his field. "Most people appreciate crops and land," he said. "We have good neighbors around here." Last week KETV-Channel 7, an ABC affiliate in Omaha, reported that a pilot had seen a UFO flying over Millard, Nebraska. The pilot said, "It was moving in ways that aren't possible for any earthly craft. It was composed of different colored lights." On Tuesday, July 23, the Omaha World-Herald reported that Kelly Reiser, 25, was driving on Highway 11 when she noticed a crop circle 25 feet in diameter, surrounded by a two-foot wall of standing barley and a four-foot outer circle of flattened grass. "It's too smooth and round," Boyd County Sheriff Duane Pavel said. "I don't really understand what could have made it. Normally when the wind takes it down, it takes it all down. It's really strange." A photo of the crop circle appeared in the July 25 issue of the Lincoln, Nebraska Journal-Star.